I love it when people send me pictures of their cats rocking the International Cat Hats! Amy was very kind to let me post her picture of the dashing Trixie. LOVE!!!! Anyone else got any cat hat pictures they'd like to send me? The lack of crafting and cooking content pictures can be blamed on my e-book reader, a Nook. I caved in and bought it before my vacation because I wanted to read Game of Thrones, Neverwhere, New Moon, The Girl Who Played with Fire, and The Girl Who Kicked the Hornet's Nest, but did not want to carry all of them since traveling light is the goal. An unexpected bonus of the Nook is that I can be reading total crap, like New Moon, and the person next to me never has to know. Since the book was downloaded from my library, I didn't even have to face a librarian to check it out. Checking out a hard copy of the Twilight would have been horrifying since the librarians know me (this is what prevents me from checking out a this book , although I see it on the shelf every time). What a great picture! That cat has a wonderful face. Carey, not yet. I wonder why not? You and I are in the same county! I love the international cat hat! And I love the patience of the cat. Mine would rip my face off. AH HOW CUTE IS THAT! THANKS FOR MAKING MY DAY! Foodycat, Trixie is a very patient kitty, that's for sure! labazs, you're welcome! We all have to thank Amy for sharing Trixie with us. and i think Rachel has "that book"--srsly! :) xoxo. You know something? I have also been absent a lot from the blog and it just happens to coincide with the purchase of my Nook. I've adored this picture since it was first posted! 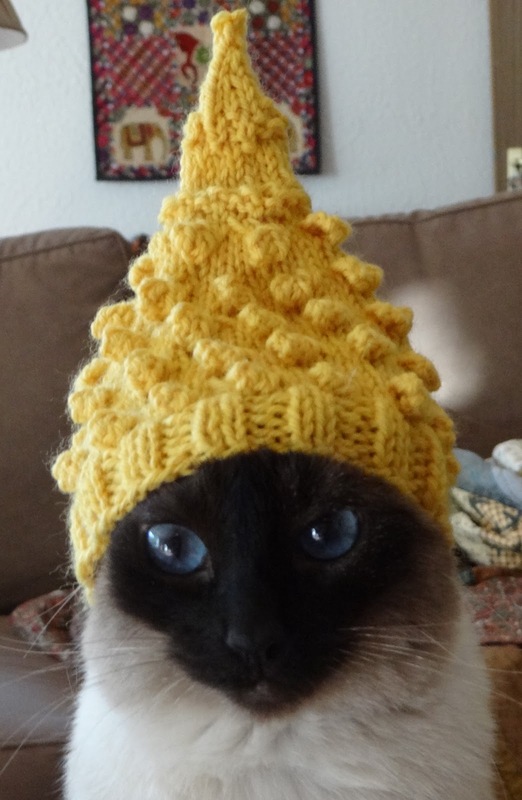 Now that I'm learning to knit and crochet, I'd love to make this hat for my own sweet Siamese kitty. Did Amy make this hat for her kitty? I'd love a pattern if she'd care to share! :) Does Amy have a blog I could reach her on? Hi bookyeti! That pattern is actually one of my original patterns, and you can find the download here: http://www.ravelry.com/patterns/library/international-cat-hat-thailand. Happy knitting!